The world of soccer has witnessed a commercialization of the sport that has generated entirely new industries that sell soccer apparel and team merchandise. Soccer retailers around the world now sell a diverse range of products that are updated on a weekly basis. One such soccer merchandise retailer, Unisport, is a Danish retail soccer shop with an accompanying online store, www.unisportstore.com. In addition to the online store, Unisport also offers a Unisport WebTV YouTube channel. This YouTube channel allows its viewers to learn the latest details about new product releases in the world of soccer. Unisport’s physical store first opened its doors in 1995, years before social media spread across the world, and it continued to expand by relocating to larger spaces throughout the late nineties. By 2002, the website www.unisport.dk was established to sell products online. The site would also offer auctions, betting tips, and news. The companies pursuit of expansion and quality propelled it to grow not only to larger physical locations but also through the online space, and this ambition is evidenced in Unisport’s active YouTube, Twitter, and Facebook profiles. These online accounts help the company sell more products by advertising their wares to widespread audiences that use these social media platforms. The Unisport YouTube channel currently boasts over 160,000 subscribers and over 22 million channel views. The channel has uploaded over 500 videos and continues to upload videos on a daily basis. Unisport presence on its WebTV YouTube channel does not have a specific author. Rather, a social media team helps to write and produce these shows for viewers. However, the Unisport WebTV channel on YouTube features two hosts, who can be considered the faces of the videos that the store produces. Jakob Michaelsen, who appeared on many of the channel’s earliest videos, often demos the products and reviews their latest innovations. In April of 2013, a second host, Valtteri “Joltter,” was added to the broadcast to complete the two-member cast that Unisport’s videos feature today. In traditional blog formats, the content is limited to what is written in the author’s posts. However, in a YouTube format such as that of Unisport WebTV, the content revolves around the entire visual product. Thus, both Michaelsen and Joltter often partake in skits when revealing new boots or discussing boot reviews. The on-screen personality of these hosts is just as important as the content of the videos to maintaining the interest of the channel’s viewers. The Unisport WebTV channel’s main audience consists of soccer players and enthusiasts who not only play the sport, but also are consumers of soccer’s footwear and apparel. One could also argue that as a YouTube channel, Unisport WebTV targets younger audiences who are familiar with viewing videos on this platform. Exploring Unisport WebTV’s archive of videos, a trajectory from targeting a local to a global audience is clear. 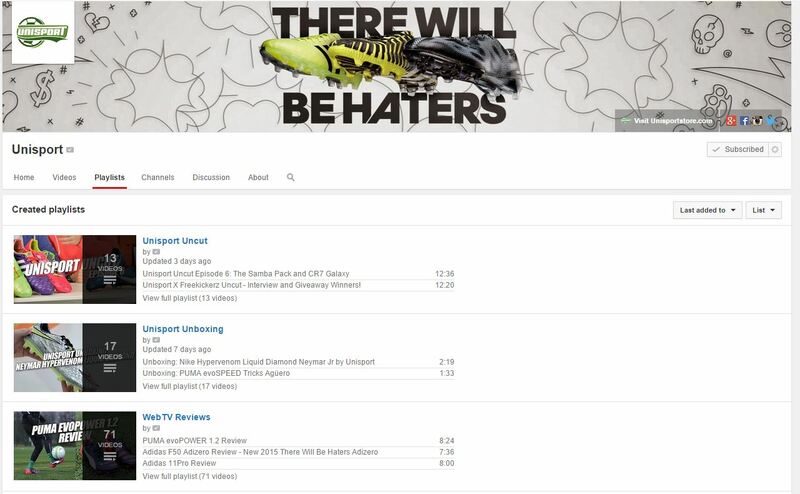 Since its first uploaded video in 2009, the channel has shifted from re-uploading existing advertisements to developing its own content focusing on soccer cleats and accessories. However, the goal remains the same. Unisport is a store that sells soccer merchandise, and Unisport WebTV is a form of advertising for those products. Throughout the channel’s history, the language of its videos and their accompanying descriptions have also changed from exclusively Danish audio and to Danish audio with English subtitles to completely English audio and Danish subtitles. These changes reflect an active push for Unisport to focus its social media efforts on selling more product by controlling their content and expanding their audience to a global level. At first glance, the Unisport WebTV’s channel is populated by soccer boot reviews, player interviews, event coverage, and other soccer related postings. The diversity of this content can only be rationalized when understanding the YouTube channel’s relation to Unisport’s online store. The Unisport WebTV’s ideology is best exemplified by its boot review videos, which provide in-depth coverage of a new boot that is released to the market. Each boot video portrays the new release as a hot product, emphasizing the new technology included in the boot, while borrowing heavily from the brand’s marketing terminology. 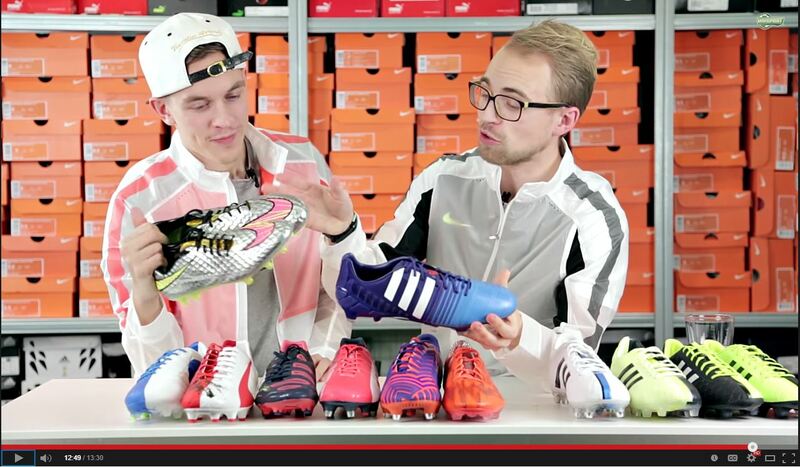 For example, in the “PUMA evoPower 1.2 Review” video, Jakob gushes about the new “Adap-Lite one-way stretch upper” and the “Accu-Foam padding” with such excitement that any viewer might believe that these technologies can actually transform them from an amateur to a professional soccer player. In reality, the impact of these “revolutionary” additions are minimal at best. By overemphasizing these features of the shoes, Unisport feeds the consumer frenzy for new merchandise. Comparing the “PUMA evoPower 1 Review” video that was posted only a year prior to the evoPower 1.2 review video reveals that Unisport reviewed both boots overwhelmingly positively. Exploring other boot review videos reveals that Unisport’s boot reviews are all positive, suggesting that every boot that Unisport sells is of high quality. Even Unisport’s non-shoe related videos such as “The history of adidas and PUMA – Christmas in 2014 Episode 11” video or interviews with famous players such as Eden Hazard are still centered around soccer brands and merchandising sponsorships. The YouTube platform also allows for a large audience of viewers to easily respond to the video and interact with a community. The comments section below each video sometimes show questions such as “what model of shoe are you wearing?” or questions requesting for a clarification about a product. The response to these questions by the Unisport channel moderators often answer politely and direct the user to the website where they can purchase the product. The process of pushing the sale is never lost on the Unisport WebTV channel. The Unisport WebTV YouTube channel provides soccer players and enthusiasts a medium to appreciate new products and in depth coverage of those products. It is an excellent source of insights on the newest products that are released in the soccer world. Its existence is also an indication of how commercialization has manifested itself in the sport through social media and global advertising.